A little known fact about my great great grandmother – this is the record in an old 1921 court case which originated in Van Zandt County, Texas. Statement of Facts, Cause No. 7698, The State of Texas vs. F. M. Richardson, 86th Judicial District Court of Texas, April Term, A. D., 1921. Grandma Fannie was subpoenaed to appear as a state’s witness in a local trial. The charge was murder. The defendant resided in the Owlet Green community and Fannie was well-acquainted with the family. She received a subpoena from the court by virtue of having encountered and observed the defendant, Frank Richardson, late in the afternoon on the day of the alleged offense. This observation was quite by accident. The case concerned the family of one of Grandma Fannie’s neighbors, the Richardsons. One brother allegedly shot and killed his own brother at their mother’s residence, in her presence, and in the presence of the deceased’s daughter. The brothers’ disagreement stemmed from ownership of the homestead. The trial was held during the April 1921 Term of the 86th Judicial District Court of Texas in Van Zandt County at Canton. One of Grandma Fannie’s sons and a grandson-in-law were also called to testify. When the docket was called and the trial began, the State’s “lead-off” witness was her son, John Morgan Martin; she was the second witness. My name is Mrs. Fannie Martin. I live in the Watts Community, three miles beyond Owlet Green on the Tyler and Canton road. That road passes my house. I remember the night Jones Richardson was killed. I saw Frank Richardson pass my house that afternoon. I really don’t know exactly what time it was, but it was nearly night; the sun may be been three-quarters or maybe not so high, or may a little higher; I did not notice particularly. There were two or three wagons in the party. I can’t say for sure, but I know there were two; I don’t remember whether there were any saddled horses or not. I saw Frank Richardson in the party and spoke to him. They were going mighty fast; the team was mighty worried. They looked like they were being mighty worried. They call it three miles from my house to where the killing occurred, and it was right on the hill on the other side of my house that I met them. I was going to my daughter’s. I said the team was trotting mighty fast – as fast as they could trot; it seemed that they were mighty worried; they were going straight toward the old Richardson homestead. Mrs. Martin; Of course they were going toward Owlet Green – I did not see them make the turn. They passed up that road a half or three-quarters of an hour before sundown and were talking. To tell you the truth I cannot see good, and I couldn’t see who was driving the other wagon, and I don’t know who it was; it was ________(name withheld) sitting in the wagon with Frank, I think; I took him to be _______(name withheld). That is all I know of the matter. I never did tell anybody that Frank Richardson was making threats; I was as innocent as could be and never thought of anything. J. M. Martin is my son; he and John Goode are brothers-in-law. No, I can’t see well and I did not particularly notice the hindmost wagon to see who was in it. I particularly noticed the gestures – I knew they were mighty interested, it seemed like; I don’t know what they were talking about, as I didn’t understand anything. My daughter was with me and we gave them the road. We can only imagine how uncomfortable and out of her element Fannie must have felt in this situation. One thing we do know from this testimony – she certainly liked to use the word “mighty”. The 19th Amendment to the Constitution, allowing women the right to vote, had only been ratified in August 1920. Women were not usually involved in public actions and their primary activities were limited to caring for children and maintaining a home. However, just looking at her picture, I can only imagine that she knew how to stand her ground! Frances Ann “Fannie” Rushing was born 31 December 1857 in Rusk County, Texas and was the second child of Allen Rushing, a Methodist minister, and his second wife, Caroline Cevers. Fannie and John Thomas “Tom” Martin married 20 June 1874 in Rusk County and moved shortly after that to Van Zandt County, Texas where their first child, Joseph Allen Martin was born on 5 July 1875, followed by ten other children. Their fifth child, Wade, died at age 4 and their sixth child, Ollie, died in infancy. They lived and raised their large family in a modest farm home in the Owlet Green and Watts community. Tom was a farmer and a peddler and Fannie was a housewife. In those days, a peddler sold wares (kitchen items, yard goods, etc.) door-to-door during the season when the weather hampered farm labor. Fannie was a member of the Methodist Church which was just a short distance down the road from their house and she was known throughout the community as a “shouting Christian”. I’m still not sure exactly what that means – more research needed! After Tom’s death in October 1914, Fannie stayed in their home and spent much of her time visiting with her children and grandchildren. 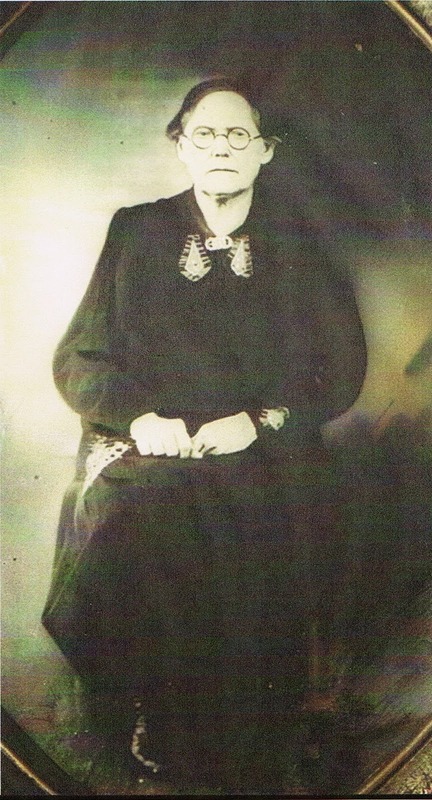 After her youngest child Luther married in 1920, he and his wife, Evelyn “Elvie” McGraw, moved in with Fannie to help her take care of the farm. In 1924, Luther was killed in an accident and Fannie moved to the home of her daughter, Beulah Corley. On 27 September 1928, Fannie married J. F. Alexander, a retired Methodist minister whom she met through her sister, Victoria Rushing, known as Aunt Vick. Fannie and Mr. Alexander moved to Tyler, where he operated a retail grocery establishment. Though their marriage was not a long one she seemed happy and was visited often by family. This entry was posted in 52 Ancestors Challenge, Martin, Rushing, Surnames. Bookmark the permalink.